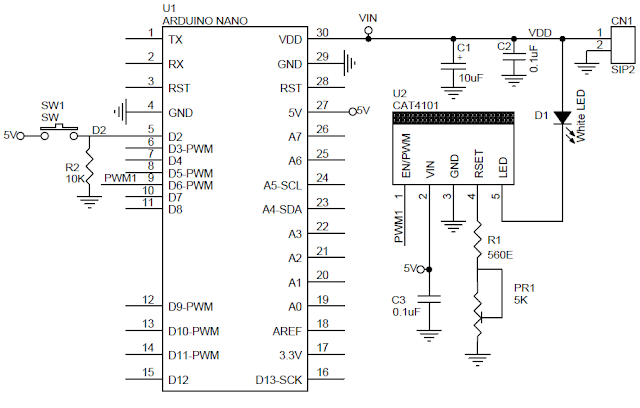 There are electronic design circuit to build constant current LED driver for Arduino Nano. One of the 1A constant current LED driver shiled circuit for Arduino Nano is look like in Figure 1 below with the main component used are Arduino Nano that popular today. Circuit like in Figure 1 above show you about the 1A constant current LED driver shiled circuit for Arduino Nano. From Electronics-lab site describe that 1A Constant current LED driver shield for Arduino Nano has been designed for verity of LED related applications. The shield provides accurate LED current sink to regulate LED current in a string of LEDs or single LED. The LED current is mirrored from the current flowing from the RSET Preset PR1. On board 1W LED is used for testing purpose. External high Wattage LED or multiple LED string can be connected by pulling two wires from the PCB and this shield fit directly on back side of Arduino Nano. Shield also has on board tactile switch connected to Digital D2 pin using pull down resistor if required for any application. On board preset helps to set the maximum constant current. PWM input pin connected to Digital pin D6 of Nano to control the LED intensity. Example code FADE-IN/FADEOUT helps to test the shield. The board built using CAT4101 IC from ON Semiconductor. The CAT4101 is a constant−current sink driving a string of high−brightness LEDs up to 1 A with very low dropout of 0.5 V at full load. It requires no inductor, provides a low noise operation and minimizes the number of external components. The LED current is set by an external Trimmer preset PR1 connected to the RSET pin. The LED pin is compatible with high voltage up to 12 V, allowing the driving of long strings of LEDs. The device ensures an accurate and regulated current in the LEDs independent of supply and LED forward voltage variation. The PWM/EN input allows the device shutdown and the LED brightness adjustment by using an external pulse width modulation (PWM) signal coming from Arduino Nano D6 pin. The driver features a thermal shutdown protection that becomes active whenever the die temperature exceeds 150°C.